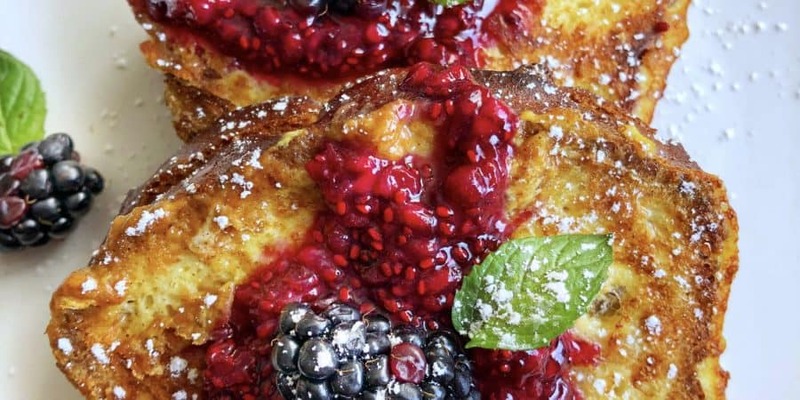 I think I have had french toast once in my life. Can you believe it? I have never been one to eat sweet as opposed to savory especially with my toast. 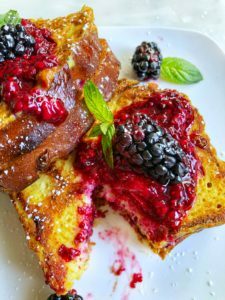 The other day, I wanted to change things up and treat my husband and me to some stuffed French toast for Sunday breakfast. Oh boy, it was so good! It isn’t the healthiest because of the carb component of being bread based but this is healthier. The jam is homemade with only 3 ingredients used with the addition of chia seeds for some extra fiber. I use organic almond butter as opposed to jiffy’s peanut butter that may have some artificial sugars. Any sweetness in the meal is natural and not refined too! In a large bowl, mix together the eggs, cinnamon, nutmeg, maple syrup, vanilla, and almond milk very well. Set aside. In a small pot, add the blackberries with the sweetener of choice. Cook down the berries on medium heat for about 5 minutes and mash them. Take off the heat and add the chia seeds. Mix together and set aside. Heat some vegan butter or coconut oil in a skillet. Spread the almond butter and blackberry chia jam on the slices of bread. Close the sandwiches. Dip them entirely into the egg/milk mixture for a few seconds on each side. Then cook in the pan for 3 minutes on each side till lightly browned. Top with some syrup and more berries!